Everyone knew there would be a Star Wars 7. Once Disney bought the property from creator George Lucas for an estimated $4 Billion, another sequel became all but inevitable. What audiences didn't know,at least until now, is whether or not the film would be any good. Purists lamented tha Lucas would have no input on the new film while casual fans celebrated the exact same thing. Personally, I was worried director J.J. Abrams would jam too many of his signature lens flares into his entry. Fortunately, Star Wars Episode 7: The Force Awakens is a fantastic, if flawed, return to the galaxy far, far away. While the film is clearly setting up a new trilogy, the story actually repackages many plot points from previous Star Wars films, most notably 1977's A New Hope and 1980's The Empire Strikes Back. In both the 1977 original and this 2015 sequel, a robot gets lost on a desert planet and looks for a steward to take it to a rebel base. These robots carry top secret messages, naturally. The robot here is named BB-8, and it stumbles upon a scavenger named Rey (Daisy Ridley) and an army deserter named Finn (John Boyega). Before long they are all swept up in galactic intrigue, as they attempt to deliver BB-8 with his message - the location of missing Luke Skywalker (Mark Hamill). Since defeating the Empire in Return of the Jedi, a Republic has been restored to the galaxy. Die hard Empire supporters, however, have reorganized into the First Order in hopes to restore their control. Darth Vader-worshiping Kylo Ren (Adam Driver) is particularly ruthless in his pursuit of BB-8. What was left of the Rebels reformed as the Resistance, led by "General" Leia (Carrie Fisher). As it would seem, the galaxy is on the brink of all out war yet again. Throughout the film, Rey and Finn run from First Order star cruisers, battle space monsters and bump into old friends. As they make their way to General Leia, they meet just the man to help, Han Solo. 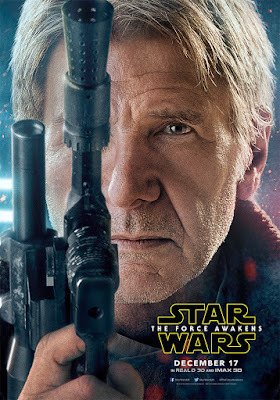 Harrison Ford is fantastic in the reprisal of his iconic role, forever a scoundrel. Newcomers Daisy Ridey and John Boyega exude charm are highly likable additions to the team. Other series stalwarts C-3PO (Anthony Daniels), R2-D2 and Chewbacca (Peter Meyhew) all appear. BB-8 perhaps steals the show as comedic relief, and it exudes the charm and enthusiasm of a loyal dog. It's performance is a testament to the skills of the puppeteers. While the audience certainly roots for the heroes to win, the stakes of the latest galactic war are not fully explained. How much of the galaxy does the First Order control? Does the Republic work and do the member planets like it? Other than being "bad," are there reasons why someone would willingly join the First Order? Presumably, this information will be further developed in the next film, not to mention dozens of video games and comics. Unfortunately, it leaves this entry unformed as a stand alone. Regardless, The Force Awakens moves so quickly, it steamrolls over most plot squabbles. Director JJ thankfully keeps a lid on the lens flares. In fact, Star Wars VII is one of the best looking films in the series from a photography point of view. There are plenty of gorgeous planets and impressive star ships. The action-adventure set pieces are excellent, and a few of them cleverly crib from the original films. Because it doesn't effectively transition to the galactic scale, however, The Force Awakens doesn't quite become "epic" in scale. My final verdict on Star Wars 7? Go see it. You were anyway, right?